The devastation caused by Hurricane Sandy is now forcing an important conversation among stakeholders involved in every aspect of development in diverse areas in New Jersey, about how to focus our shared efforts on rebuilding in a more resilient, sustainable way, so that we can support the full range of lifestyles, livelihoods and recreation opportunities that have made New Jersey unique. New Jersey Future has been involved in a pilot project, inspired by recommendations in FEMA’s National Disaster Recovery Framework, that has placed local recovery planning managers (LRPMs) in six Sandy-affected communities, to assist them with long-term resiliency planning. Now, three years after the storm, we have released a new report assessing the program’s successes and challenges, including lessons learned and recommendations for future implementation of the program. 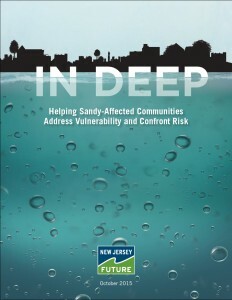 Download In Deep: Helping Sandy-Affected Communities Address Vulnerability and Confront Risk. The question of where and how to rebuild various areas of New Jersey after Hurricane Sandy has been a complex and nuanced one, involving urban density, property values, lifestyles, employment opportunities and significant tourism revenues, weighed against the risk and costs of similar severe weather events in the future. In addition, local development is governed by a dense network of plans and regulations: municipal zoning and master plans; the state’s environmental regulations, including those dedicated to water resources and to guiding coastal development; and the ways in which we’ve directed investments in water, transportation and power infrastructure. Continued to work to achieve FEMA Community Rating System certification. Health Impact Assessment: New Jersey Future conducted a Health Impact Assessment to evaluate the effects of buyout strategies on personal and municipal health in the Mystic Island section of Little Egg Harbor. Read more. Download the full report. The report also describes actions the state should take to support communities that want to implement risk reduction strategies. Land use decisions seek to enable people and property to withstand future storms. All levels of government adopt comprehensive risk assessments that consider long-range sea-level rise and other factors. Governments use the risk analyses as a driving factor in their hazard mitigation plans, land use plans, land preservation efforts and capital investment decisions. Strong land-use planning elements are incorporated into local and regional hazard mitigation plans. An afternoon symposium Oct. 30, 2014, in conjunction with the Lincoln Institute of Land Policy, focuses on how to advance, and pay for, increased resilience in the wake of Superstorm Sandy. Approved for 2 AICP CM credits. A one-hour webinar explaining a new, parcel-based tool that assesses financial vulnerability to coastal flooding and sea-level rise. Friday, May 15, 2015, noon – 1:00 pm. An interim report, three years after Hurricane Sandy, on New Jersey Future’s groundbreaking local recovery planning manager program, including lessons learned and recommendations. October 2015. A conference on the first anniversary of Superstorm Sandy examines the rebuilding progress made to date, and the work still left to do. Dec. 15, 2014 — New Jersey Future’s wish list for 2015 — adequate transportation funding; homes that are affordable; updated statewide water supply plan; a new tunnel under the Hudson River; protection from future storms and a new State Development and Redevelopment Plan.